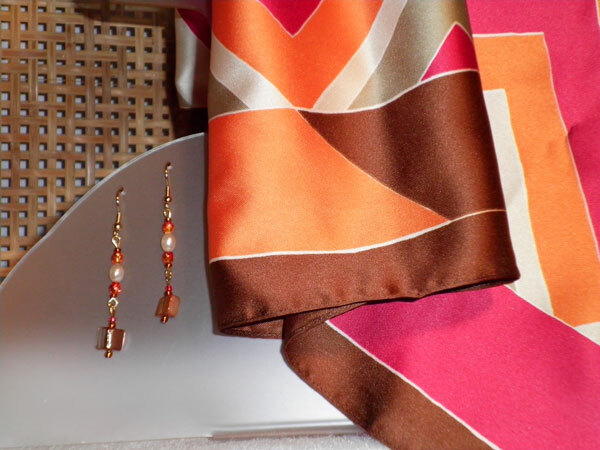 The scarf is 21 x 21 square with a geometric pattern in orange, fuchsia, brown, ivory and taupe. The coordinating earrings measure 1.5 inches from the finding loop. They start with an oval shaped ivory pearl bead surrounded by brown and fuchsia seed beads. The dangle has a beautiful mother of pearl chip surrounded by more seed beads. This is one of the instances where the set looks much better than the picture.